Polish gas pipeline operator GAZ-SYSTEM signed an agreement with Croatian counterpart Plinacro to move forward towards achieving the North-South Gas Corridor, during the Three Seas Initiative Summit, early July. The two operators underlined their will to boost the liquefied natural gas (LNG) market in Central Europe. As concrete steps, Plinacro started to implement the first stage of construction works at the Krk LNG terminal, and expand the transmission infrastructure towards the neighbour countries. On the Polish side, GAZ-SYSTEM plans to increase regasification capabilities of the President Lech Kaczyński Terminal in Świnoujście. 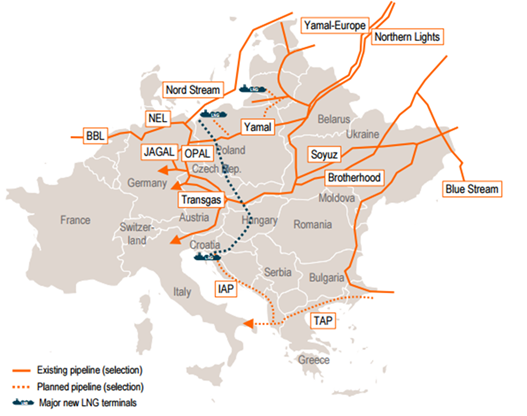 These two terminals represent the main entry points of a transmission network of pipelines and interconnectors, an European project known as the North-South gas Corridor – a set of interrelated gas transmission infrastructure projects which connect Central and Eastern European markets from the Baltic to the Adriatic and the Black Seas. “Besides the need to upgrade existing infrastructure, there is a particular need for new interconnectors, especially along the north-south axis across the EU-11, both to enhance the region’s ability to better distribute existing energy supplies as well as gain access to new ones. Currently, the existing connectivity across the EU-11 is inadequate, which poses an obstacle to both energy security as well as the completion of the Single Market”, one can read in the policy paper: Making it happen. Paving the way for the Central European North-South Infrastructure Corridor, issued by CEEP and Roland Berger. Full paper.